*Strasbourg/CoE/Angelo Marcopolo/- Experienced CoE's Director for Information Society and Fight against Crime, Jan Kleijssen, from the Netherlands, Speaking to "Eurofora" on the occasion of a 2 Days Conference on Medias and Pluralism, particularly in the Modern Digital landscape, organized by the CoE together with "Reporters without Borders' NGO for Press Freedom, observed that the Legal Protection of Journalists would have to be Extended also to certain New Media Actors, (as the CoE has already started to officialy acknowledge : See Infra), in order to become able to succesfuly Face the Challenges for Pluralist Democracy Nowadays. 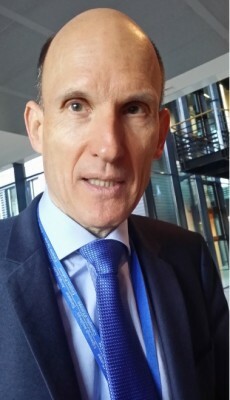 - My main "Message" to this 2019 Conference is that, while, "Still, the Old Challenges on Regulators, to ensure Medias Ownership's Transparency, and about Finances, on Concentration, etc, they stay", nevertheless, "there are also New Challenges, with the Digital Media Platforms", Kleijssen told "Eurofora" from the outset. - Particularly "when they are acting whether with Less and less Human Editing, but More and more Automated Editing, (i.e. Artificial Intelligence), because there is a lot of Algorithms in it, a lot of Processes in it, (mainly on Web News Distributed via Artificial Intelligence : "that's an Issue"). => "So, it's important to make sure that Regulators (i.e. States, European/International Organisations, etc) can face these Challenges too". + And, "f course, a Challenge that underlies it all, at the Moment, is also about the Physical Safety of Journalists", as it's noted in "the (CoE's) Secretary General's (Thornbjoirn Jagland's) Latest Report (2018), with very Worrying Results of the Surveys carried out in Europe", which show how Many Journalists" faced such serious problems, he reminded. - "F.ex., Everybody knows the case of Daphne Caruana Galicia in Malta, (a brutal Murder, where investigations still Delay in lots of things), followed by another one in Slovakia, (with investigation apparently Advancing much faster), as very High-Profile cases (of Killings of Journalists), where, what happened is, of course, Absolutely UnAcceptable", Kleijssen denounced. + "But, in addition to that, there is a Lot of "Low Intensity" Intimidation, Harassment, etc., of Journalists. And this is something on which we (CoE+) have to be Alert too, for Medias' Pluralism, as it's part of it", Jan Kleijssen concluded, as far as the 2019 "Cornerstones" are concerned. 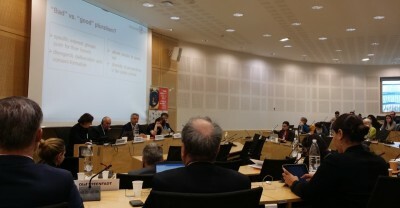 - In relation to that, "Eurofora" Questioned the CoE's Director for Information Society, about the Controversial Views of "Some (who) Persist to abuse of an Old kind of "Fiscal" Definition of Journalism, claiming that it would Merely mean ...+51% of Revenues paid by any Media Business, regardless of the Content of the Work provided. Thus, f.ex., even a lazy and passive, simple Radio-TV Presenter might have much More Rights and Protection, than a Creative Writer who Risks even his/her LIfe to Investigate "Hot" Issues, Help Discover all the Truth, and reveal to the People the full Findings, when he believes that they affect the General Interest in our Society, as we denounced. - "No ! ", reacted Kleijssen. In fact, "there are Texts of CoE's Committee of Ministers which have already said that the Definition of "Medias", and their (Legal) Protection, should be "Extended". - This includes, f.ex., also certain Bloggers, and Other New Media Actors, who Publish News Regularly, and, may be More Read than Traditional Newspapers, also, sometimes highly Succesfully". - He said that in Reply to "Eurofora"'s reminder of the case of Daphne Caruana-Galicia, brutaly Murdered in Malta, who had been Hindered, by a Chief Editor, to Publish Critical News in her Traditional "Weekly" Newspaper, (as her Family had revealed to "Eurofora"), and was obliged to create a WebNews Site where she Published Alone, Dangerously Exposed,(See, among others, also: http://www.eurofora.net/newsflashes/news/webjournalistmurder.html, http://www.eurofora.net/newsflashes/news/euparliamentpresidentoncoeandjournalistmurder.html, http://www.eurofora.net/newsflashes/news/daphnewebjournalistmurderenquiry.html, http://www.eurofora.net/newsflashes/news/daphnepressfreedomandcorruption.html, http://www.eurofora.net/newsflashes/news/rsfleaderondaphnemurderandjournalism.html, http://www.eurofora.net/newsflashes/news/eucoenewsondaphnemurder.html, etc). + Such a Topic (as Journalists' Protection Status being Extended also to New Medias Actors at the Web), "might also be discussed", during this Conference, later Today, and/or in various other Events on Medias' "Pluralism", where "there will be a lot of Angles", Kleijssen guessed. 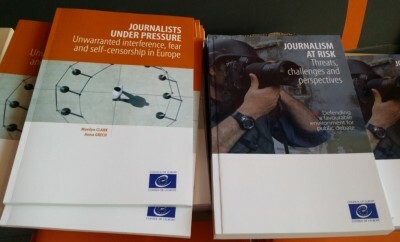 >>> In this regard, 2 landmark CoE's Books, about "Journalism at RISK : Threats, Challenges and Perspectives", and "Journalists under PRESSURE : Unwarranted Interference, Fear and Self-Censorship in Europe", Published on 2015 and 2016, respectively, had been rightfully Chosen by the PanEuropean Organisation for Human Rights, Democracy and Rule of Law of Strasbourg, in order to be Displayed on the spot and Offered to the Participants in this Conference. (1) In the First CoE's Book "Journalists at Risk", 2015), Aidan White (Long Time former Secretary General of the Internationonal/European Federation of Journalists, and Nowadays of the "Journalists' Ethical Network", in an Exceptionaly Long Article, basically Urges to Extend most of Traditional Journalists' Legal Protection also to some "Other Actors" of Medias in our Digital Society, on the Condition that they will Accept to Practice the main Principles of Press Deontology, (See: http://www.eurofora.net/newsflashes/news/iachrcoebookandefjsgonjournalismdefinition.html . 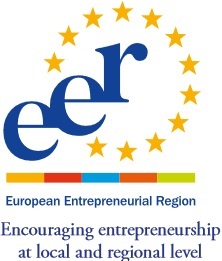 An Idea that "Eurofora" had Initially suggested to White as Early as since 2009-2010 : See http://www.eurofora.net/newsflashes/news/digitalpress.html, http://www.eurofora.net/brief/brief/webmedia.html , etc). (2) In the relevant "Eurofora"s Article" (November 2015 : http://www.eurofora.net/newsflashes/news/iachrcoebookandefjsgonjournalismdefinition.html), we refer to 2 Decisions of the Inter-American Court of Human Rights (cited by a CoE's CM Representative : Comp. Supra), which stressed mainly that : "Journalism canNot be equated to a Profession", i.e. Not "Only through those who are Enrolled in a certain Professional "Colegio" (Corporation)", "because", in fact, "Journalism is the Primary and Principal Manifestation of Freedom of Expression of Thought, .... which is an Inherent Right" of a Person, "and has a Double Dimension : Individual and Collective", including Both "the Right of an Individual to Express himself Freely, AND that of Society as a whole to Receive Information", so that any "Violation" of that, Threatens also "to Deprive Society of possible Sources of Information", affecting "a CornerStone upon which the very Existence of a Democratic Society rests", since "it's Indispensable for the Formation of Public Opinion", and "a Condition sine qua non for the Development of Political Parties, Trade Unions", etc., and "the Means that Enable the Community, when Exercising its Options, to be Sufficiently Informed", given the Fact that "a Society that is Not Well Informed, is Not a Society that is Truly Free". + That's why, the very "concept of Public Order in a Democratic Society, requires the Guarantee of the Widest possible Circulation of News, Ideas and Opinions, as well as the Widest Access to Information by Society as a Whole", and "is not conceivable without Free Debate, and the possibility for Dissenting Voices to be Heard". 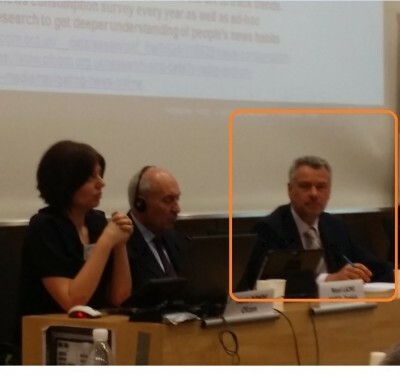 (3) Shortly Afterwards,the Second CoE's Book, cited above, ("Journalists under Pressure": 2016), clearly Adopts a Similar "Definition" : "Journalist = A Person who is Regularly Engaged in Collecting or Disseminating Information to the Public, with a Journalistic (Public Interest) Purpose". (P. 11). + "Definition of Key Terms : ... Journalist = ... 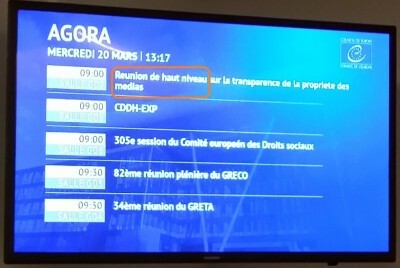 The Council of Europe's Committee of Ministers, in 2000, Defined a Journalist as "any ...Person who is Regularly (Or professionally) Engaged in the Collection and Dissemination of Information to the Public, via Any Means of Mass Communication". (Appendix to Recommendation No. R (2000) 7..." + "Recommendation CM/Rec (2011) 7, on a New Notion of Media, Recognized that the New Media, Created by both Technological and Social Change, has seen the Entry into scene of a New Breed of Reporters : Bloggers, Citizen Journalists, and Others, who Create user-generated Content. The Adoption of this New Notion of Media, Necessitates the Recognition that "the Scope of Media Actors has Enlarged, as a result of New forms of Media in the Digital Age". CoE 2014". (P. 24). - "Often, Web Medias Bypass Traditional Medias", observed, f.ex., Nouri Lazmi, President of Tunisia's Independent High Authority for AudioVisual Communication. - Already, "for Young People aged 16 - 24 y.o. ", the "Web has become the 1st main Source of News", noted Maria Donde, "Ofcom"s Expert for International Content Policy, (even if Radio-TV still remains "the Most viewed", according to a recent Poll on "Web Medias' Consumption", at least in the UK). + Moreover, their "Real Consumption is "Under-Reported", Donde found. Perhaps, it's also because "Most On-Line News" are read through "Smart-Phones", and "when Passively Strolling". - But they are bringing Both "Good and Bad Journalism", or "Risks of Fake News", Lazmi warned. + Most of such Medias use to "Behave as Political Opponents in an Arena", with "Strong Political polarisation". On the Contrary, "Neutral Medias are Marginalized", f.ex. in Libya, etc., regretted Professor Carola Richter, from Berlin's Freie University. - The "Bad" aspects are the Excessive Role of "Interest Groups", and the InSufficient dimension of "Deliberation" and/or "Consent-Building" functions, he Criticized. => But the "Good" aspects, are that Web Medias "Allow People to Speak out", with a "Diversity of Perspectives in Public space", Professor Richter stressed. + This Importance of this Key point was particularly underlined by Tarlach McGonagle, Senior Researcher/Lecturer at the Information Law Institute of Amsterdam University, "as part of a Wider Participation in Public Debate". - Indeed, ECHR has already underlined (f.ex. since "2010") "States' Obligation" to support structural "Pluralism", for which "States must be Guarantors", he observed. >>> And, those New, Web Medias, precisely, help boost a kind of "ReConfiguration of Public Debate". - This is achieved now Both with Traditional "Journalists", but "also with Oher Actors" at the Web, such as various "Bloggers", "Corporations", etc., he reminded, on this Focal point, (Comp. Supra). 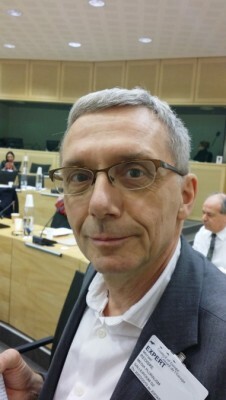 => I.e., Nowadays, including that necessary "Extension" of Traditional Journalists' Legal Status, also to certain "Other Media Actors", (as CoE's Director for Information Society and Fight against Crime, Jan Kleijssen, has just Highlighted, in Reply to a relevant "Eurofora"s Question : Comp. Supra). - In fact, "Europe seems to be in Transition" nowadays, concluded CoE's specialized Head of Information Society Department, Patrick Penninck, towards the End of the "Medias and Pluralism Regulation" Debate, (astonishingly using an Expression that French former EU Parliament's President, the famous Simone Veil, had previously used with "Eurofora" in Sorbonne, Paris, almost a Decade earlier, concerning the different, but also Topical Issue of Popular Participation to EU Elections, (See: ...). Scientific innovation joined to Faith for Human Rights, Eastern Partnership and fight against the Crisis, but above all, the need to overcome the "Crisis of Trust" from EU Citizens, are the main priorities for new EU Parliament's President, Polish Jerzy Buzek, that a 555-votes-strong majority of MEPs on July 14, Strasbourg made a living symbol of the fact that, 20 years after the fall of Berlin Wall (1989 - 2009) there is no more an Eastern or Western Europe, but only one Europe, as the head of the largest group of MEPs, ChristianDemocrats/EPP, Joseph Daul, stressed after the event. Speaking later to a group of Strasbourg's Journalists, including "EuroFora", the new EU Parliament's President clarified his stance on concrete topical issues, as f.ex. that of Turkey's controversial EU bid, which was one of the main issues of the June 2009 Electoral campain, clearly won by his party of ChristianDemocrats/EPP : - "At present, Turkey does not fullfil none of EU conditions", he stressed, (See infra). 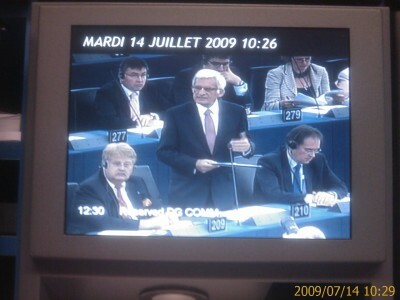 Buzek is well known in Strasbourg and to "EuroFora" as EU Rapporteur for the Framework Program of Scientific Research and Development of Technologies. A Natural Science Professor from the Historic and Religious landmark Polish City of Częstochowa, active in the famous Solidarnosk grass-roots social movement, he served 4 years as Prime Minister (1997-2001), before being elected as MEP in 2004 and 2009, after he brillantly won the latest EU Election at the head of his party (EPP) almost doubling the number of its MEPs from 15 to 28 ! But, the most important of all, is the urgent need to overcome the "Crisis of Trust" between EU Institutions and the People he stressed : - EU "Citizens often don't understand us", denounced Buzek, launcing a call to "do anything for EU Citizens to understand our work" in EU Parliament : "We (MEPs) need to make EU Citizens involved" in "what we are doing every week, in Strasbourg and Brussels", he proposed. Pointing f.ex. to the hot "Debates" with "strong arguments" exchanged between MEPs during the preparation of their Legislative Decisions, in Committees, delivering often hard struggles between initially opposed points of view, long before forging a majority at the final vote, sometimes more than a year.. Therefore, EU Parliament will be "open to your criticism, for discussion and exchange of views", he promissed to Journalists in Strasbourg. 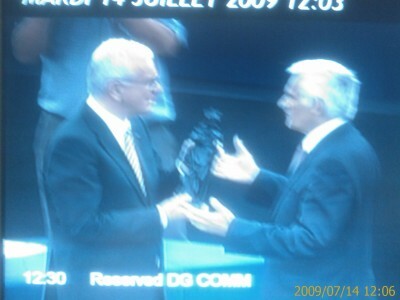 This is related also to the symbolic gift that Buzek chose to give to the out-going former EU Parliament's President, Hans Gert Poettering, (2007-2009), his collegue in the ChristianDemocrats/EPP, who brillantly won 2009 EU Elections in Germany : A genuine statute of sainte Barbara crafted in Silesia's black Coal by Polish Miners : Those simple but strong people who fought for social change against some technocrats and bureaucrats disguissed into so-called "real-socialists" of old times. (PHOTO). It's enough to have seen a popular open air mass, at Warsaw's center, with many thousands of people, old and young, simple workers and intellectuals mixed together, with references to Poland's history and struggles for survival and liberty, through various ages, (as fex. that organized at the eve of CoE's 2005 panEuropean Heads of State and Government for the beatification of late Pope John-Paul II), in order to understand what such symbols mean..
- "We know that during Enlargement, the process can be blocked by failure to resolve this kind of issues", This concerns also other enlargments' cases", and "these rules are always in force" he warned. 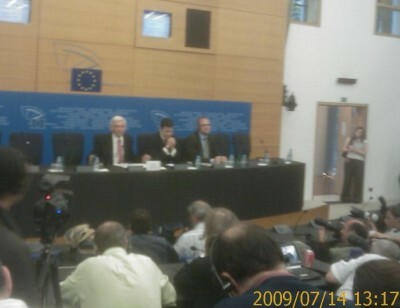 But Buzek avoided to directly reply to a queston on "French and German EPP' calls to define the Borders of Europe", as a German journalist asked him by making a reference to French President Nicolas Sarkozy, and German Chancellor Angie Merkel's, critical statements on Turkey at the June 2009 Electoral campain. - "Concerning Enlargement, there's always the same rules : There have to be Criteria, which have to be respected if a Country wants to join the EU", he started to simply reply. - "For my country (Poland) it took us 15 Years to fullfil these Criteria", Buzek reminded, indicating, if proportions are kept, that Turkey, fex. would have to spend some 25 years before eventually joining the EU..
- "Countries wishing to join the EU need to Change their Systems", as we (Poland and other former Eastern European Countries) did, he stressed. - "Turkey" has, "first of all", to fullfil (EU) Copenhagen criteria". Bevause, currently, none of them is fullfiled by Turkey", New EU Parliament's President, denounced, speaking later to a group of Journalists, including "EuroFora". In particular, on Human Rights : - "We (EU) can never forget Human Rights", because "this is at the very Foundations of the EU", Buzek added. On the contrary, when he referred to EU Enlargment for the "Western Balkans Countries ", Buzek appeared upbeat, finding "promising situations", despite "difficulties" in the Past, since "Countries are queuing to become EU members", and this "generated changes", as he said. 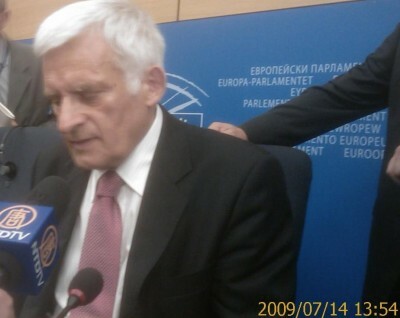 Concerning China, where a journalist observed that the recipient of EU Parliament's latest "Sakharov prize" for freedom of thought is "still in prison", Buzek found that since the 1999 events in Tien Amin square, "we see differencies on Human Rights still today", and expressed his "support" for those who try to ameliorate the situation.